Woema, pronounced ‘Vooma’ like in the ‘Va va Voom…’ kinda way, is a really cool adventure bike travel business based in Johannesburg, South Africa’s biggest city. With a background in adventure travel TV documentaries, they’re a good fit for Charley. This year Woema is supporting Charley’s adventure rides across southern Africa, supplying amazingly functional kit and some great expertise. From wider off road footpegs to great waterproof and dust proof bags, satchels and hydration backpacks – if you want some adventure gear, this is the place to go in South Africa. Woema, Glen Gables Shopping Centre, Lynwood Gen, Pretoria East, Gauteng, South Africa. 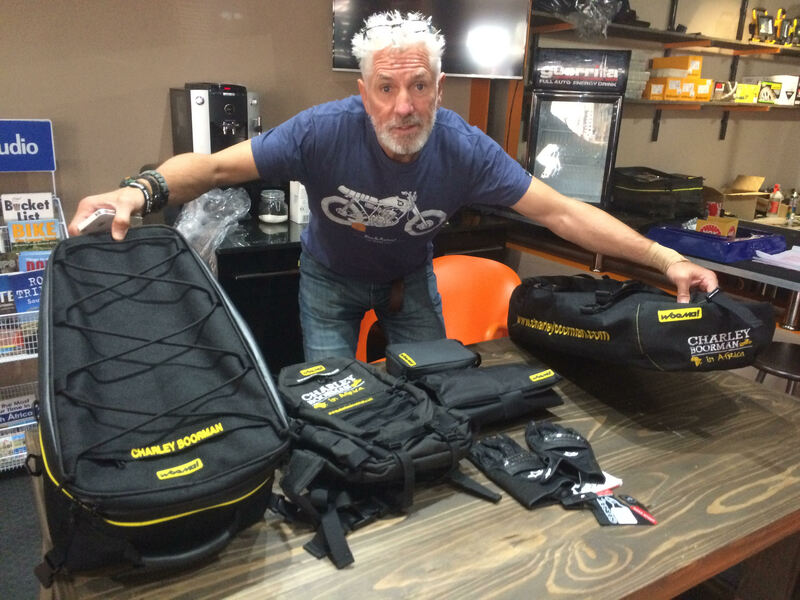 Here we have our glamourous assistant, Billy Biketruck showing off some of the Woema kit we’ll be using in South Africa this year. Tail packs, Hydration bags and mega cool luggage bags – waterproof and dustproof. We’ll report back on how the kit holds up to the rigours of the Namibian desert and the cold mountains of Lesotho – but we’re pretty confident – the kit is awesome! You can check out Woema’s website and follow them on Twitter and of course Facebook – check them out, click on their logo’s below… And of course if you want to join Charley on his great big African Adventure – keep an eye on our website as we announce dates for 2016.